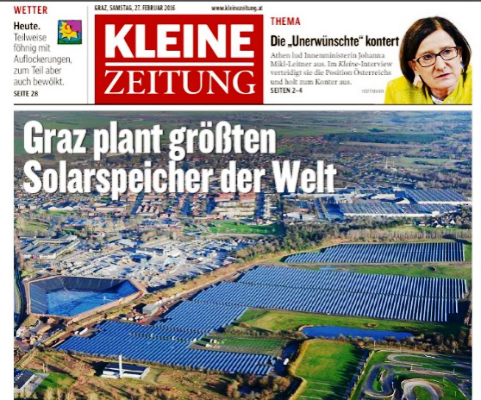 The Austrian municipality of Graz is preparing for the post-fossil fuel heating era: On 27 February, the front page of national newspaper Kleine Zeitung (copies sold each day: around 300,000) read “Graz plans largest solar storage worldwide”. According to the news article, regional energy provider Energie Steiermark and Austrian solar thermal system supplier S.O.L.I.D conducted a feasibility study for a huge solar district heating plant called Big Solar – with promising results. The study and the news article both references the world’s largest collector field in Danish Vojens with 70,000 m² (49 MWth) as a successful example of how to undertake such a large project. At the beginning of April, Energie Steiermark confirmed the plans for Big Solar’s realisation in a press release about 2015’s annual financial statement. Investment of EUR 196 million. Holter also pointed to the most convincing arguments in favour of the solar-based heating system: long-term price stability independent of fossil fuel prices and high supply security. “This is the big shift in district heating towards green energies,” the Speaker of the Management Board of Energie Steiermark, Christian Purrer, is quoted in the above-mentioned article. Plans are to install the solar field on meadows south of the city because ground-mounted systems are the most cost-effective, as the case studies from Denmark have shown.